Curated exhibits are often meant to tell a story. In Creative Workshop exhibitions, since the pieces come from artists of different backgrounds, skill levels, and experiences, the story of our group exhibitions is one that must be unearthed from a jumble of individual stories. In the current Adult Student Show, multiple different narratives emerged from the myriad pieces we sorted and received. Among these narratives are a tale of natural forms, an assemblage of tea cups, and a wall of pears. One of the most striking walls presents an array of natural themed pieces. This wall begins with Phyllis Abram’s untitled piece, a ceramic vessel composed of irregularly shaped rings stacked upon one another. The exterior is imprinted with fossil-shaped forms and glazed in browns and dark blues. 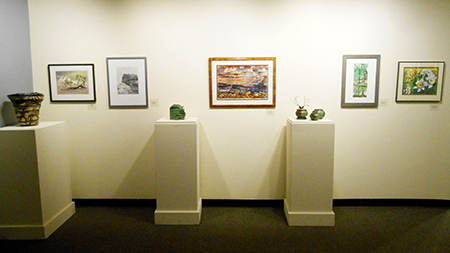 Two watercolor artists display ambitious works in the next two pieces: Liz Billing’s Driftwood and Linda Delaney’s Desert Rock. Mary Crowe’s piece Flow, a moss green ceramic pot adorned with florets of beautifully sculpted clay, serves as a transition. It leads the eye to a landscape of warm brown and pink rocks at Lake Superior, painted by artist Jayne Fox. The last three pieces include Donna Carson’s pottery set titled The Organics, which incorporates both live branches and clay, and Laura Morihara’s Reflections, A Study. The wall comes to completion with Marilyn Monkelbaan’s Dancing Daffodils. Another wall of artwork presents the story of two friends. 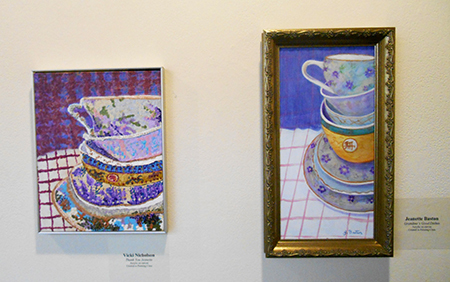 It includes two very similar pieces, both renditions of the same stack of tea cups. Artists Vicki Nicholson and Jeanette Baston, both participants in Angela Amato’s painting class, chose to paint from the same photograph. As the story goes, Jeanette was the first to begin painting from a photo source of the tea cups, and Vicki borrowed her idea. Although the two works were composed from the same picture, they have very different artistic qualities. Jeanette’s traditional approach contrasts with Vicki’s technique. Her rendition of the tea cups uses an entirely different species of mark-making, as she fills her tea cups with dots of color, rather than with continuous lines. Jeanette’s piece is titled, Grandma’s Good Dishes, and Vicki’s is titled, Thank You Jeanette, as a tribute to her friend. Additional relationships are seen throughout the exhibit in a quartet of pears and a wall of gazes. 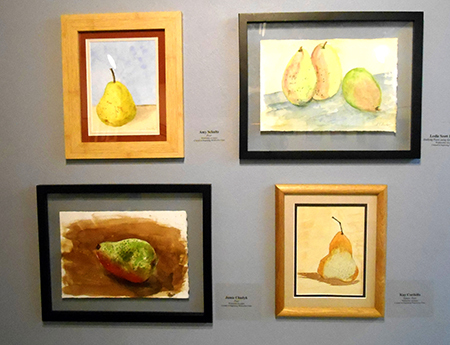 The four pears were created in Larry Keefe’s beginning watercolor class, by artists Amy Schultz, Jamie Chudyk, Kay Cordello, and Leslie Scott Lindler. The paintings were created as an exercise, and their success proves that these burgeoning artists are off to a great start. Another relationship is displayed in a wall of gazes. This triptych of images contains two animal portraits, along with a portrait of a human baby. 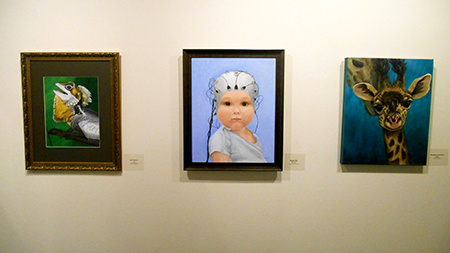 Rachel Wu’s Baby EEG resides in the middle, showcasing an EEG-clad child whose luminous eyes stare out at the viewer. It is surrounded by Kyle Myer’s Louie and Dominica Gruschow’s Timothy. This trio of pieces evokes a feeling of tenderness, as the gaze of a helpless baby is paired with the innocence of the gazes of Myer’s iguana and Gruschow’s giraffes. The overarching story drawn from these smaller stories seems to be that anyone can make artwork they are proud of. As staff, we are pleased to support the Creative Workshop students who proudly display their work. It is one thing to read about the intricacy of this summer’s Adult Student exhibit, and another to experience it. Come visit the Creative Workshop’s Lucy Byrne Gallery, now through August 4th, to experience the show. In an array of artworks from such different sources, surely you will be able to move beyond the connections and narratives that we have made for you, and create a set of stories for yourself. Posted: June 26th, 2014 under Creative Workshop, Education, Exhibitions.